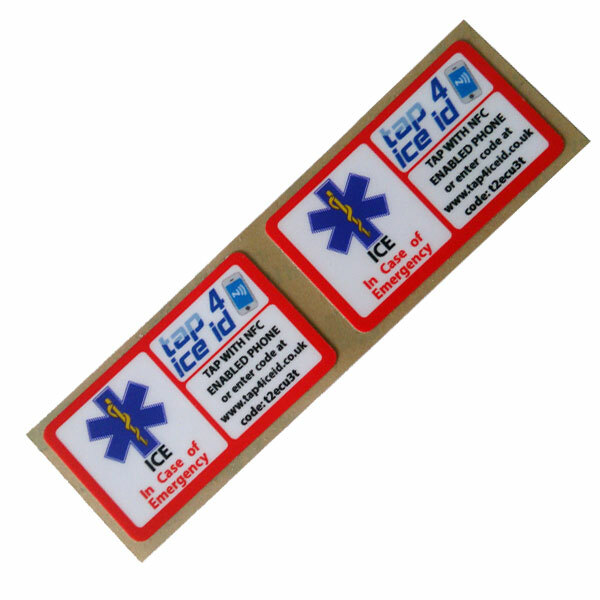 ICE ID stickers display the paramedic star and ICE which makes them easily recognisable by emergency personnel. 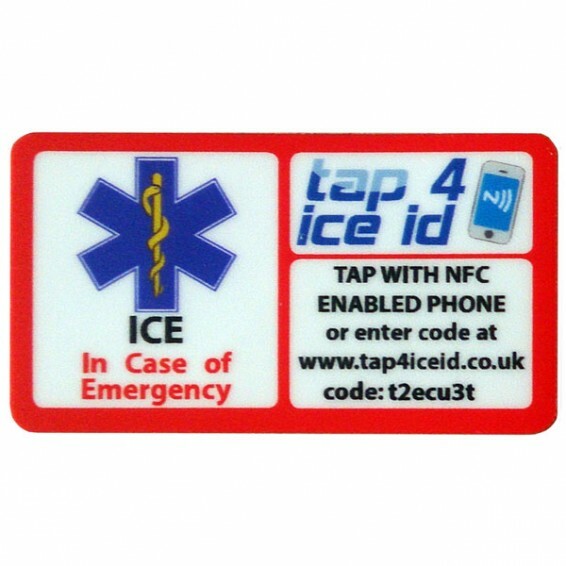 Pack contains TWO NFC encoded stickers which link to your online ICE profile. The information that can be added to your online emergency profile include – your name, year of birth (NOT your Date of Birth), a photo for identification, ICE contact details, current medications, medical conditions, allergies and more. This is all entered through a simple to fill out online dashboard form. Each ID sticker displays the internationally recognised paramedic star medical symbol and ICE – In Case of Emergency making it clear this is something first responders need to look at. The NFC logo is also displayed along with a unique code to enter on a website just in case no one has an NFC enabled phone to tap the sticker with – this allows iPhones, PC, Mac, and tablets to access the ID profile. 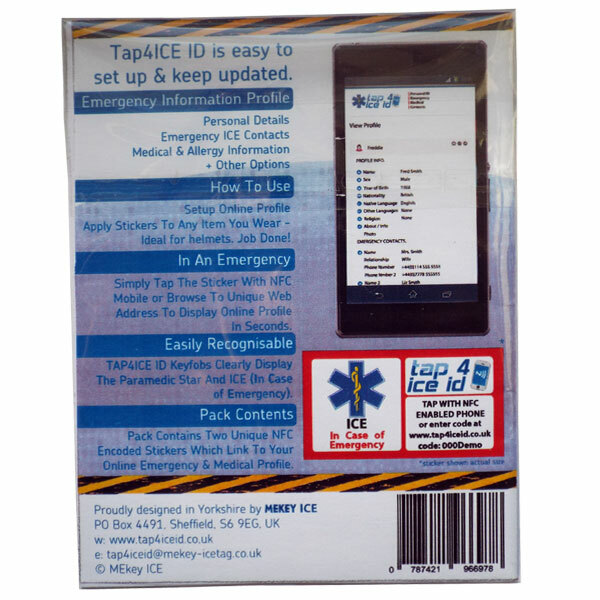 The information available through the ICE stickers is easily displayed to any first responder or other emergency service personnel. By either tapping the sticker with a NFC enabled mobile phone, or entering the unique code displayed on the ID sticker on the website (PC / Mac / Tablet / Non NFC enabled mobile) , the Emergency contacts, medical and allergy infomation is displayed on the device within seconds..saving precious time that in some cases could be the difference between life and death. All a first responder has to do is simply tap the sticker with their NFC enabled mobile phone to display the emergency ID within seconds. NFC (Near Field Communications) is available in around 88% of mobile phones (Q2 2016). Easy to setup using the online dashboard feature. Simply fill in all relivent information, upload a photo for identity purpose and save. You can even hide certain items of information from public view that only you may need access to. The profile can be translated into English, French, German, Italian, Spanish and Portuguese. If any information changes simply log back into your emergency profile and update – no looking round for bits of paper and crossing out and trying to fit in the extra details. CYCLISTS – MOTORCYCLISTS – BUILDING SITE WORKERS – SKIERS – HORSE RIDERS – ROCK CLIMBERS – SKATEBOARDERS and more. 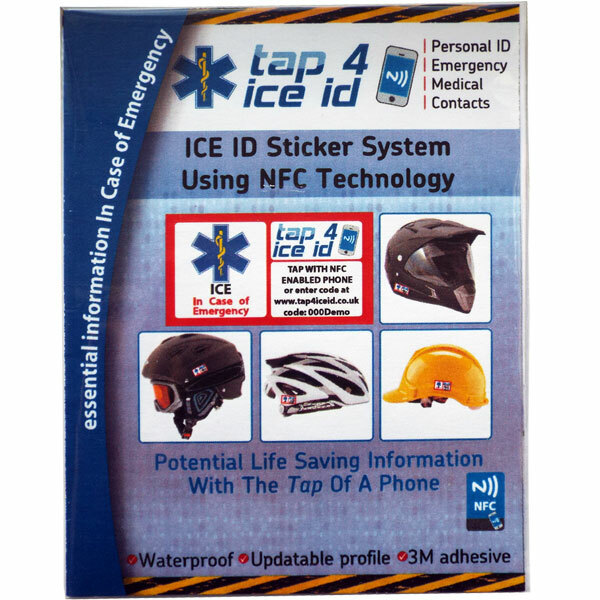 If you wear a helmet, you should wear Tap4 ICE ID stickers. ICE stickers arrived today – profile account opened and activated. Clever bit of kit, is better than having ICE card inside helmet lining and green dot on visor (latter last about 5mins). I will mention to Bike mates and see if I can send them your way to buy the ICE stickers.